← Do You Want to Get Unplugged? Junk Hauling Gift Card – Who Wants It? For all my friends in the DC area. Do you need to clean out the garage before the snowy season? Or maybe you need to get rid of the old sofa in the basement before your Christmas party guests arrive? If your clutter is causing you extra stress this holiday season I have a gift for you! 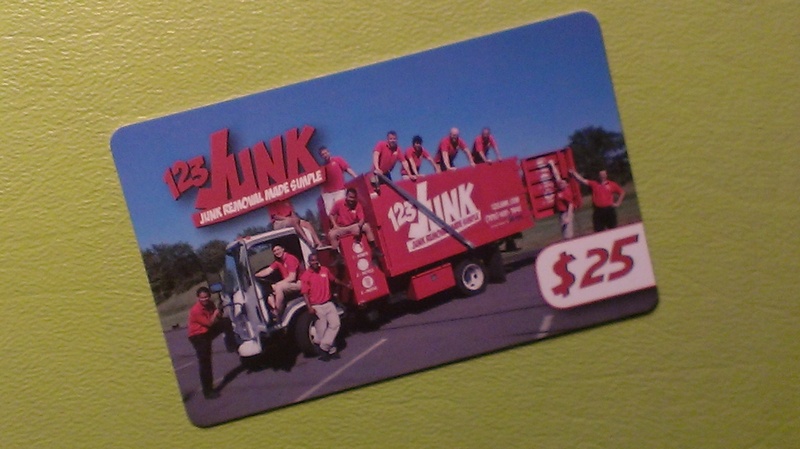 My favorite junk hauling company, 123JUNK, has offered one of my DC area clients a $25 gift card towards their services. These guys are great. The best service you’ll ever receive; on time, polite, clean, quick and thorough. If you are interested, be the first to comment on this post and the gift is yours! This entry was posted in Residential Organizing and tagged Give Aways, Junk Hauling. Bookmark the permalink. 1 Response to Junk Hauling Gift Card – Who Wants It? Your blog is interesting…thanks for sharing the organizing tips. I need to cleàr my garage too.